Bambos arundinacea Retz., Arundo bambos L., Bambusa arundinacea Retz. Bambusa bambos is a perennial Poaceae with a 24-32 year life cycle. It grows in erect clumps up to 20-35 m high. It is thick walled, with a diameter of 8-18 cm. There are 1-3 spines at each branch node. Leaves are thin, linear, up to 20 cm long. It takes 12 years to reach maturity. Flowering is gregarious and occurs after about 16 years. After flowering, seedling is profuse and the clump dies soon afterwards (Duke, 1983). 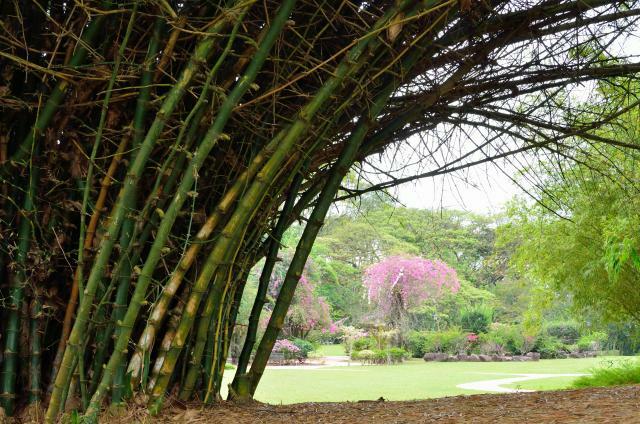 Bambusa bambos is cultivated for building and scaffolding material. The leaves can be used as fodder while shoots can be considered as vegetables and prepared to make food (Duriyaprapan et al., 1995). The seeds are edible and used in times of food scarcity (Freedman, 2009). The shoot shells, a by-product of the industrial canning of bamboo shoots, are available as both fresh and boiled material, and can be used as feedstuffs (Liu et al., 2000). Bambusa bambos is native to India, Southeastern Asia and Southern China. It is now cultivated throughout the tropics, in Southeastern Asia and especially in East Java, Singapore, the Malaysian Peninsular, Thailand and the Philippines. 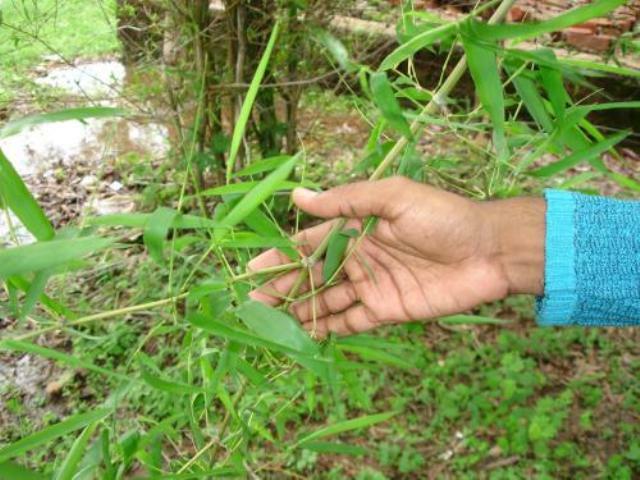 Generally, bamboos grow between the latitudes 40°N and S, but grow best under frost-free conditions: the big bamboo forests usually occur between 15-25°N and S of the equator (Ecocrop, 2009). 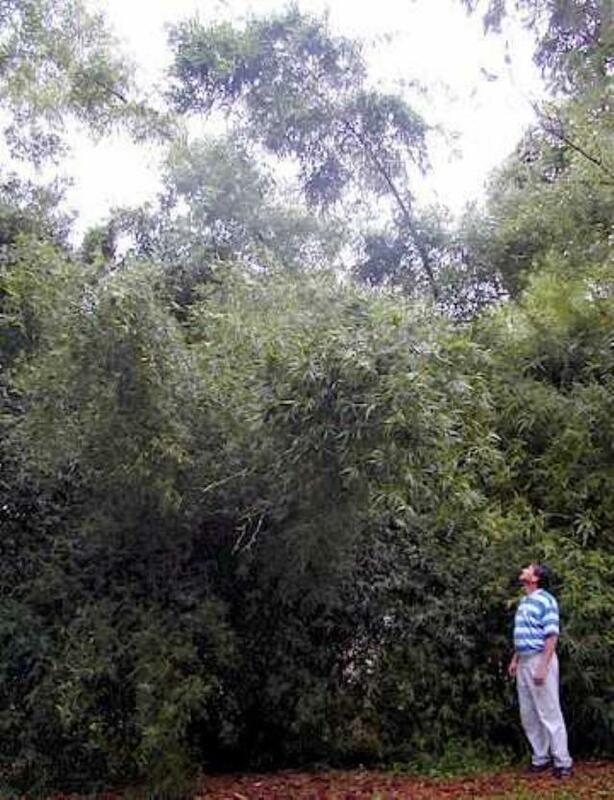 Bambusa bambos grows up to an altitude of 1000 m in the Nilgiris and hills of Southern India (Duke, 1983). It prefers rich to medium fertile soils with a good water supply. Bambusa bambos may be used for reforestation and stabilization of eroding banks. It is often planted as wind-breaks and is recommended in agroforestry (Ecocrop, 2009). Bambusa bambos is reported to contain HCN (Kumar, 1991). The Council of Scientific and Industrial Research of India (1948-1976) reported that young shoots contain 0.03% HCN and are poisonous if not cooked. Bamboo shoot shells included in a rice straw diet had positive effects on feed intake, growth rate and feed conversion ratio of growing heifers (Liu et al., 2000).